Hello! My name is Julia V. Schrank and I am a new graduate assistant for Book Traces. I am a Ph.D. student in the Department of French, so get ready for some Francophilia in my blog posts! 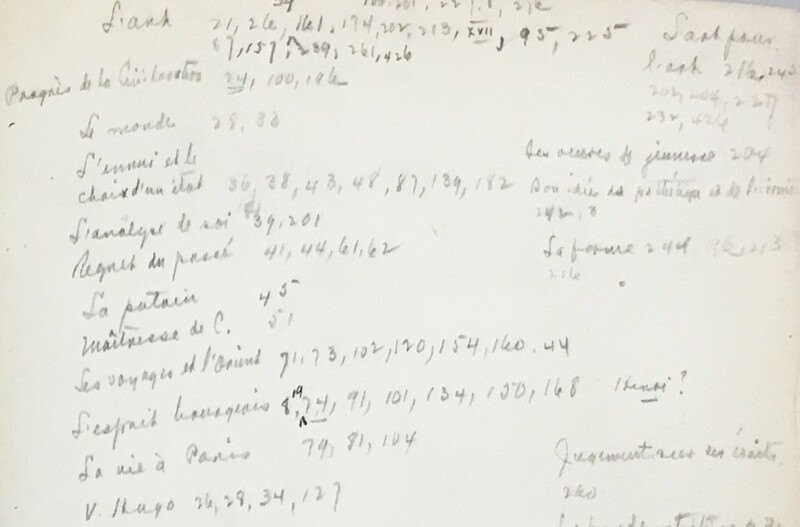 Bequeathed to the University of Virginia by University of Chicago French professor Algernon Coleman (1876-1939), this volume of French literary giant Gustave Flaubert’s letters provides a fascinating inside look at how academic workflow has remained much the same across centuries. Before we scrutinize Coleman’s work habits, it is important to know just who he was. 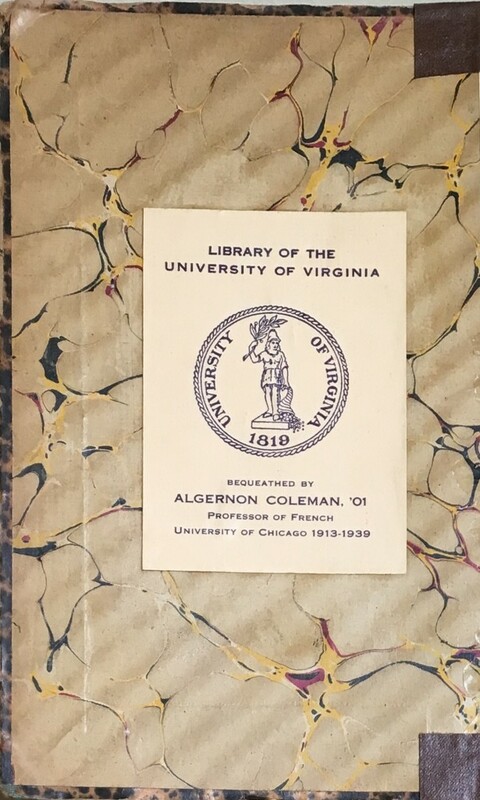 In the Vita of a reprint of his dissertation, held in Special Collections in a volume of “Rare Virginia Pamphlets,” Coleman reveals that he was born in Halifax County, Virginia in 1876 and completed his undergraduate education at the University of Virginia (Wahoowa!). He writes with affection that it was here at UVa that “Professor Richard H. Wilson had awakened [his] interest in the study of the Romance Languages.” After various teaching appointments around the state of Virginia, Coleman decided to further his dedication to the romance languages, with a particular emphasis on French literature. Coleman spent “a quarter…in graduate study” at the University of Chicago (for what we can probably presume to be equivalent to a modern Master’s Degree) and then obtained his doctor of philosophy degree at Johns Hopkins University. It was in Baltimore that Coleman produced his dissertation, Flaubert’s Literary Development in the Light of his Mémoires d’un Fou, Novembre, and Éducation Sentimemtale, in 1913 at age 37. From Baltimore, Coleman returned to the University of Chicago, where he served as a professor from 1913 until his death in 1939. Despite having completed his Ph.D. in Maryland and leading his academic career in Illinois, Coleman never forgot his Virginia roots and bequeathed much of his personal library to UVa. The formal traits of Coleman’s idiosyncratic notes tell us much more about his academic persona than his biographical details ever could. 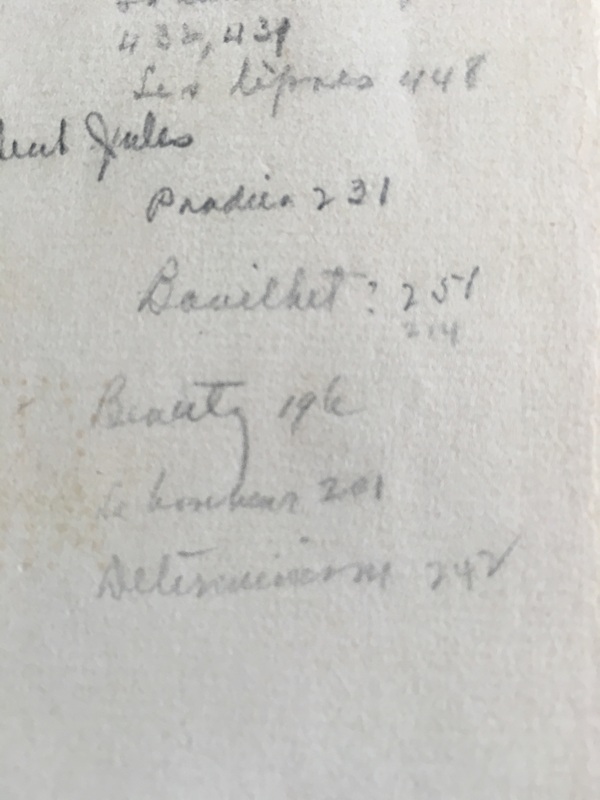 Handwritten traces in Coleman’s personal volume of Flaubert paint a picture of a fastidious, efficient character who developed systematized research methods over a lifetime. While one can imagine that this procedure of painstakingly pulling out themes, ideas, places, and people for reference must have been very time-consuming, it is important to remember that Coleman was working in the age before highlighters and neon paper flags. Since these colorful ways of marking out passages of interest were unavailable to him, Coleman created a centralized location for his “highlights,” which each correspond to a graphite check-mark in the margins of the indicated page. This practice speaks to a highly organized research procedure; it is clear that Coleman knew what interested him and wanted to be able to find it as quickly as possible. The idea that Coleman is “correcting” his printed volume of correspondence tells us two very interesting things about his academic ideology. First, Coleman is challenging the authority of the printed word in a strikingly contemporary way. It is clear that Coleman’s numerous additions in blue pen are not in his own voice, but in the style of Flaubert. 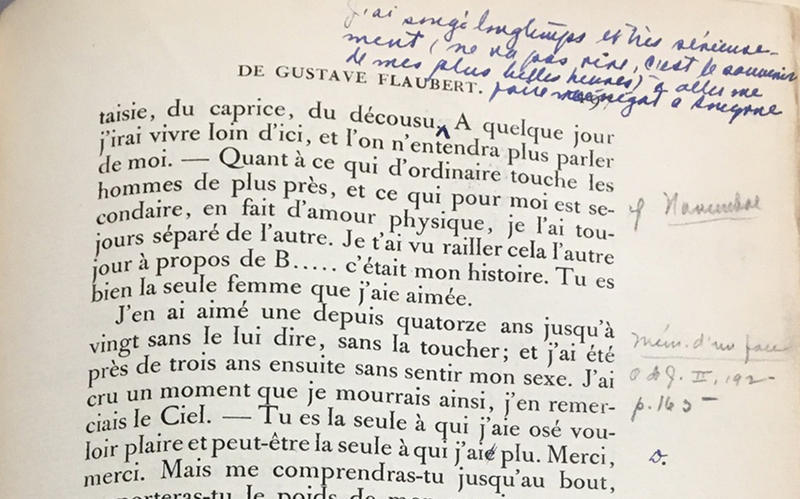 With this detail alone, we know that Coleman must have corroborated the wording of Flaubert’s actual, handwritten correspondence. Instead of implicitly trusting that his 1910 edition “conforms” to “l’édition orginale” published in 1887 by nineteenth-century Paris publishing behemoth Charpentier, Coleman insisted on digging further before he drew any research conclusions. This idea that a printed edition of a manuscript is inherently untrustworthy shows us how the current idea that the “original” copy in all of its materiality is the best resource came into being. 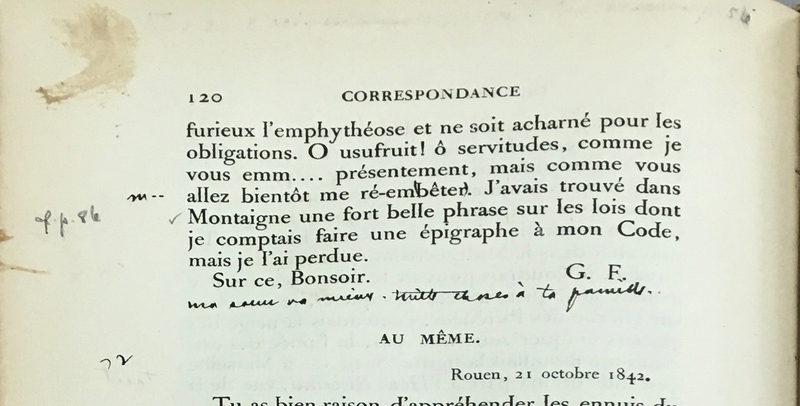 Coleman writes “Écrite au crayon,” “Written in pencil”…in pencil! That Coleman is this conscious of a material trait of Flaubert’s letters is sufficient proof that he must have believed that trans-Atlantic travel to the source was imperative for French scholarship. Just as today’s scholars in foreign language departments often take research sabbaticals to the country of their field’s origin, we can imagine that Coleman also engaged in this sort of trans-oceanic quest for knowledge. “I have been assured that such letters exist, but I have found it impossible to get access to them. Some subsequent student, more fortunate than I, may, therefore confirm or overturn with ease many results which, in the following study, must needs be held as subject to correction” (Coleman 7). In a very “meta-” way, Coleman recognizes that his own research is just as falsifiable as his printed edition of the correspondence. This affirms that his research and his persona fundamentally challenge the authority of the printed word, just like twenty-first-century scholarship. While Coleman’s workflow is decidedly modern, we are reminded by the nature of his scholarship that certain things have changed. His emphasis on mining Flaubert’s correspondence in order to discover biographical “truths” hidden in the author’s œuvre, as we see in his dissertation, seems very passé indeed. In the wake of a series of movements springing from Roland Barthes’s watershed essay “The Death of the Author” in 1967– which implores modern textual scholars to separate the text from the person who wrote it– this approach of scrutinizing Flaubert’s letters down to the word level seems very “nineteenth century” indeed. However, Coleman’s determination to fit into the academic vogue of the day still draws parallels to modern literary studies’ tendencies to follow emergent trends in order to be part of the current conversation. Despite some outmoded scholarship practices, when viewing this volume and its traces globally, we are left with an artifact that shows us that modern scholarship is not as cutting-edge as we might think. Algernon Coleman, with his creation of a personal “search” function, his coffee and ink stains, and his fundamental questioning of the written word, demonstrates that although research trends have changed, methodology has stayed much the same. Flaubert, Gustave. Œuvres Complètes de Gustave Flaubert. Vol. 2. Paris: Louis Conard, 1910. Print. Coleman, Algernon. Flaubert’s Literary Development in the Light of his Mémoires d’un Fou, Novembre, and Éducation Sentimemtale. Diss. Johns Hopkins University, 1913. Baltimore: The Johns Hopkins Press, 1915. Print.